An organism, such as a shell, is buried in sediment, such as the ooze on the bottom of a sea. Water later dissolves the shell, leaving a hollow in the hardening sediment. 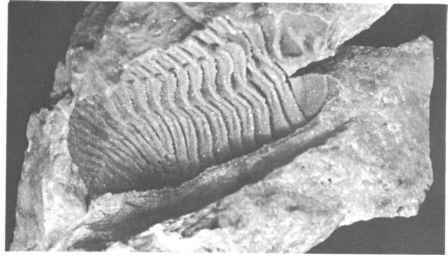 The sediment becomes rock enclosing a cavity that exactly preserves the external pattern and shape of the shell. This is a mold. Sometimes a mold becomes filled with sediment or other mineral matter, producing an exact duplicate of the external pattern and shape of the shell. This is a cast from the mold. The pseudomorphs discussed under petrifaction are casts. The petrified wood pseudomorphs found in western lava flows are for this reason commonly called limb casts. 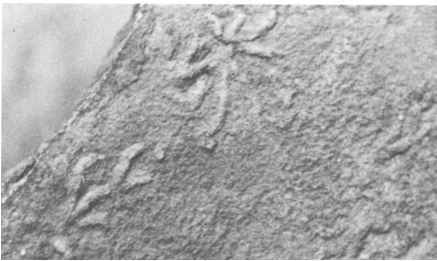 Dinosaur and bird footprints are molds in the sediments that yielded to their footsteps long ago and then hardened. 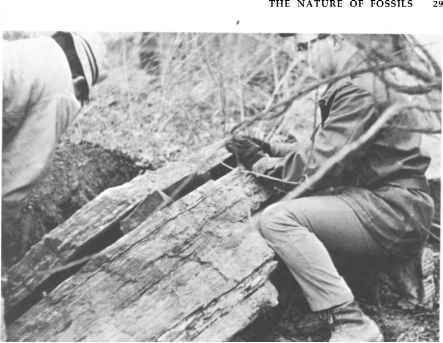 A rock layer that formed above and filled them would, when pried apart from the lower rock, show a cast of the footprint. 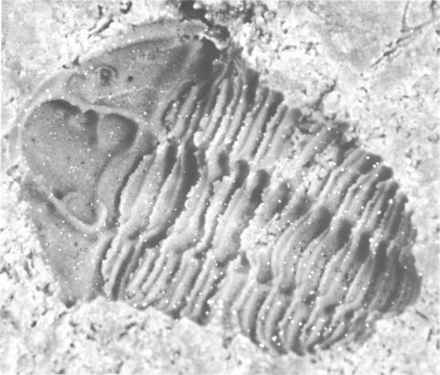 Mold of a trilobite, Calymene niagarensis, in dolomite of Silurian age. This mold was empty; no steinkern was found inside. Racine, Wisconsin. This odd fossil is scarcely recognizable as a cup coral. This is a mold of the top of the coral, like a piece of clay pressed into the hollow top and then removed. External mold of a straight cephalopod. Silurian; Illinois. inside the mold is a loose fossil that has a superficial resemblance to the mold in the rock. This is an internal mold, a mold of the inside of the shell, or it can be thought of as a cast of the inside of the shell. Paleontologists refer to these double-duty fossils by their German name, steinkerns ("stone kernels"). Such double molds are formed by an elaborate maneuver of nature. A clam, for example, is buried and becomes filled with mud. If the shell is dissolved away, an external mold would be left. Inside it would be the internal mold of mud, taking the place of the body of the clam and faithfully reflecting the detail of the inside of the shell, just as the external mold reflects the quite different detail of the outside of the shell. 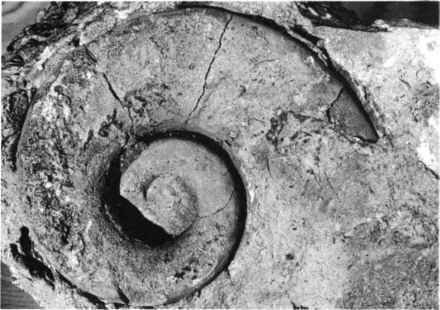 Such a pair of molds is far more useful than an external mold alone, because it shows not only external details, but such important things as muscle attachments in mollusks, body-cavity shape and size in crinoids, and thickness of the horny exoskeleton in trilobites. A steinkern, or internal mold of Calymene. 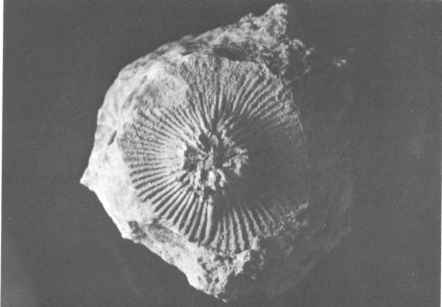 Silurian period; Lemont, Illinois. 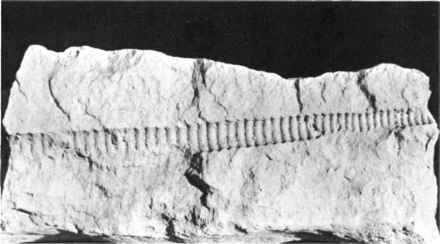 of the large marine ichthyosaurs in the Jurassic rocks at Holzmaden, Germany. Even the soft fleshy paddles of the reptiles made their mark in the rock. Archaeopteryx, a Jurassic link between reptile and bird, had never been recognized as a bird until specimens came to light in the limestone quarries near Eichstatt, Germany. 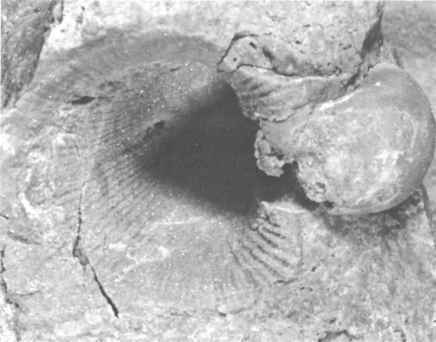 The bones were in place on the slabs, and so were distinct impressions (molds) of the feathers, wings, and tail of this early toothed bird. How is a mold formed in nature example? What is the difference between a steinkern and a cast? What are mold that are filled with sediments? How are petrified wood diffrent from molds and casts? Is a brachiopod fossil a cast or mold? Is the trilobite fossil a mold? Is a cast fossil hollow on the inside? Is a criniod a cast or mold? Where are molds and casts found?